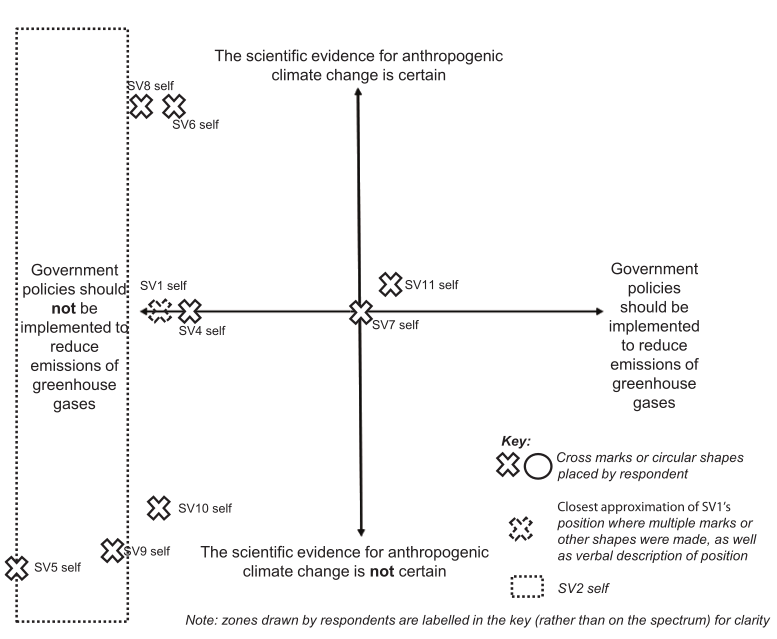 Amelia Sharman and Candice Howarth have a new paper out, Climate stories: Why do climate scientists and sceptical voices participate in the climate debate? It’s in a journal called Public Understanding of Science, but ironically, as Ben Pile remarked, it’s paywalled. It might be possible to find it on the Russian pirate site Scihub, but of course if you download it from there you’ll be breaking copyright law. There is a short commentary How to make the climate change debate more productive on the paper at LSE, and there was also a draft working paper posted at LSE almost a year ago, which is similar to the final version. The introduction discusses the polarisation of the climate debate between climate scientists and those they call “sceptical voices” (SVs). They say that they are interested in finding common ground between the two groups. In this context they mention the meeting that took place between climate scientists and sceptics in 2014, and they cite the WUWT blog post about it, which must be a rarity in the academic literature. The content of the paper is based on interviews with 11 climate scientists and 11 sceptics — who are not named but are either people mentioned in newspapers, bloggers or people associated with GWPF. They asked them how they saw themselves, how they saw the other lot, and how useful it was taking part in the public debate. Apparently the main self-perception of climate scientists was “a youth-driven aspiration to contribute positively to the environment” along with “a heroic desire to do good”. The sceptics saw themselves as “crusaders for truth”. When they got this interesting result, perhaps the authors should have stopped and thought about the wisdom of putting these 11 people all in one box and labelling it “sceptical voices”, particularly since they themselves wrote an article previously about exactly this problem of putting people into boxes and labelling them. The paper notes that “Many SVs railed against the public perception of the debate as ‘black and white, yes/no'”. But apart from that criticism, most of the paper is quite good in comparison with some of the social science literature on the climate debate. The comments of participants on both sides are reported, I presume accurately, and presented in a fair way without any spin. The section on the views of the other side suggests that climate scientists are correctly aware that there’s a wide range of sceptical views, but at least one of them thought that sceptics feel threatened and look for “ways to justify not accepting it”. Hmmm. Unsurprisingly, each side thought the other was politically motivated. Perhaps the most interesting section is the one on participating in the debate. Apparently both sides feel a “sense of duty” to communicate, while another common theme was, again, the disapproval of labelling. Reported comments from the sceptics on why they joined the debate were varied, covering “passion for science”, “justice and poverty”, the “politicised” climate debate and the “rubbish” of green energy policies. In the conclusions they note the overlap in the themes “expressed by both actor groups”, such as the sense of duty and the fact that “both groups explicitly self-identify as moral actors acting upon deeply held convictions”. There also seemed to be common ground over the question of uncertainty. They say that these common factors aren’t generally acknowledged. The paper ends with the suggestion that these overlaps could lead to constructive dialogue and conflict reduction. Please keep comments in that spirit! Tags: debate, public opinion, sociology. Bookmark the permalink. I don’t know about any other ‘sceptic voices’ on here and elsewhere, but personally I don’t self-identify as a “crusader for truth”. It’s more an irritation at the way science has been co-opted and corrupted by politics and self-interest. Annoyance at the arrogance of those who have and continue to proclaim that AGW/CAGW is an unassailable scientific truth. Anger at the way this ‘unassailable scientific truth’ has been used as an excuse to destroy the economy, the environment and peoples’ lives and livelihoods. I’m not on a mission, I’m just reacting to a bad situation. ‘Studies’ like this just further add to the myth of ‘climate scientists vs. sceptics’ in my opinion, but they do keep people gainfully employed in the burgeoning global warming industry, whose vast tentacles reach into virtually all areas of academia and public life now. I have to say that I’ve been impressed with their work from the start. Not that it’s perfect but that it’s a refreshing change. Each successive paper shows that there is real progress being made, rather than the facts are being made to fit a preconceived and static notion. In some ways they would learn more from studying the believers than sceptics. In that they might realise that there isn’t really common ground at all. Most determined believers are supported by public money, anti business and left wing. That would include renewables employees who benefit from enforced subsidy. The mindset of those people is that money is no object. They are programmed to think that there is enough money to solve all life’s ills if only someone else would stop hoarding it. To the rest of us, AGW only represents one of the things that might or might not need money and that the money pot they want to spend is ours. It’s why government ministers can promise to solve AGW one minute and cut subsidy the next. Real life intrudes. 1) There are no cheap, reliable alternatives to fossil fuels. Even nuclear (not cheap) would struggle to cope with demand and flexibilty. Also, safety in an uncertain world makes them a dubious option. 3) The only way to reduce CO2 is to abandon everything else as an issue and impoverish ourselves financially, physically and in overall progress. 5) No country or government is packed with enough believers to ignore the first 4, so unilateral action isn’t going to happen (we won’t count North Korea). I know a lot of countries including the UK flirt with it, but pull back from the brink every time. We run the risk they misjudge it and we fall over anyway. Sceptics are not the odd balls that need to be convinced, we’re just the more aware end of a very big block (which includes most believers too). Only when you accept the above, is it worth discussing the science and how it might be improved. I’ve written often that scepticism is not the disease, it’s a symptom. Trying to suppress the symptom might make you feel a bit better but it doesn’t make the disease go away. Just as each person who gets the flu has a slightly different presentation, so each sceptic has a different set of features. The root cause is what I outlined above. 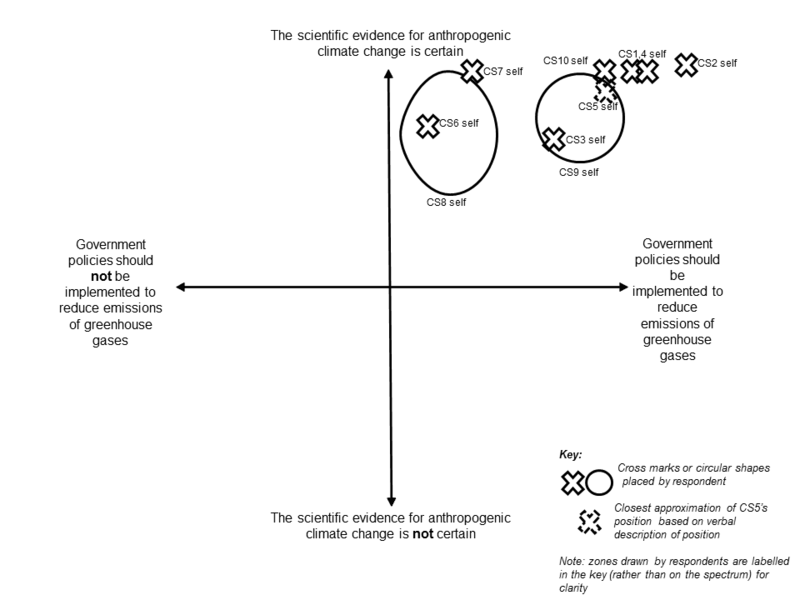 The Fig1 chart (by link) shows a clustering of CS opinions of beliefs the upper right quadrant. That is strong beliefs in the certainty of the “science” and strong beliefs on the need for Government Policies to combat the issue. The Fig2 chart displayed in the article for sceptic views shows a much broader divergence of views. The two data of the two Lewandowsky, Oberauer & Gignac surveys – the blog-based and US internet surveys – showed a similar conclusion. That is strong belief in “climate science” is closely related to a belief in strong government, by the scepticism is not as strongly related to limited government. I examine it here. This gives interesting issues. Climatology/Climate Science has nothing to do with ethics, policy formulation or policy implementation. Yet climatologists claim ability to speak on all these issues over and above specialists in these academic disciplines. It would seem that ideology has more to do with support for climatology than scepticism. The only way to reduce CO2 is to abandon everything else as an issue and impoverish ourselves financially, physically and in overall progress. That is clearly alarmist nonsense. We can reduce CO2 in many ways and by many means, none of which need to impoverish us. In your dreams Raff. Tell your idea to our steel workers, tell it to the other factory workers who have lost their jobs already because of high energy prices. About 50% of the UK CO2 reduction has been the flip from coal to gas. One fossil fuel for another. Our closing nuclear stations will reverse part of that, just as Germany’s closure of their plants has seen a rise in emissions (and their total is bigger than ours due to their bigger manufacturing base). Another large chunk of our CO2 footprint has gone because we have lost a lot of our heavy industry. We still use the products, we now just import them. No real CO2 saved. There have been some genuine savings from efficiency but that’s a finite tool. UK CO2 figures are equivalent to VW emissions tests, in other words they’re fiction. SOME CO2 reduction can be made but not the levels that are required to significantly dent the CO2 total (real reduction on 1990s level is calculated to be about 7%). So when you’ve stopped picking the low hanging fruit, how do you reduce CO2 other than lifestyle reduction and very expensive alternatives? As it happens some of our reduction HAS already been at the expense of lifestyle due to the recession. Look at the moaning that went up over that. All significant future reductions (without hardship) require technology that doesn’t exist or nuclear. Come back when the new technologies work and we’ll debate whether the cost of them is affordable. Don’t be fooled into thinking Germany’s renewables are proof, that they work well. Germany uses its neighbours as part of its own network, dumping electricity when it can’t handle what they produce. That means those CO2 savings should be shared out across the recipients making Germany’s figures a lot less impressive. Germany also uses France’s nuclear system as a backup. What if France decides it doesn’t want nuclear? What about when we all want to tap into that finite resource because the wind isn’t blowing and the sun isn’t shining? We’re only on the lower slopes of reducing CO2. The higher you want to go, the steeper the costs. A series of charts that tell the real story of UK emissions. The hope over experience bit comes when they pretend that other countries will achieve what the UK has failed at. From that I gather you agree. Your sentence: “The only way to reduce CO2 is to abandon everything else as an issue and impoverish ourselves financially, physically and in overall progress.” was wrong in every sense. No, ‘hope over experience’ means the opposite of agreeing. All the graphs show is that what we’ve tried so far isn’t really working (7%, low hanging fruit). The last graph relies on other countries doing better than 7%. Experience should tell them its not possible. And these policies ARE costing a massive amount of money we haven’t got. Isn’t that impoverishing ourselves? I’ve seen no evidence of the UK or Germany being impoverished by CO2 emissions reduction. Have you? That may be because emissions have not been reduced by much, all the same if there impoverishment is such a direct and inevitable consequence of emissions reduction, one might expect to have seen some evidence. And what is the “everything else” that has been or has to be abandoned? Exactly. And did you expect everyone to be affected immediately? The poorest are affected first. People working for high energy low profit companies are affected early too. That you can’t see any evidence for energy hardship is par for the course. So you don’t actually have any evidence that lowering CO2 emissions does or will impoverish us, do you? As is typical of the warmist mindset, you constantly shift the burden of proof upon the opposition, whilst conveniently ignoring the dearth of evidence which might support your own view. Do you have any evidence that lowering CO2 emissions does NOT cause poverty among certain groups of people? But playing your game, here is a report which does indeed indicate that the rush to renewables has resulted in increased energy poverty and decreased industrial competitiveness, which must inevitably impoverish the nation state as a whole. JJ, of course some will suffer, coal miners in particular, oil producers too. Some always suffer from economic change. But Tiny clearly said we would “impoverish ourselves”, which I took to mean something more than that some favoured interest groups won’t like it. I guess it was just one of the sweeping claims Tiny likes to make that sound great when played to an uncritical audience (like a bunch of “skeptics”, delight in the irony), but that fall apart when dissected. Value destruction is a nebulous term. If I sell you shares in my renewables firm and some time later you can only sell them for half the original price, that might count as “value destruction”. But I’ve still got your money. Value is relative and changes wildly. “Value is relative and changes wildly.” Sweeping statement? Renewables yes, their value will fluctuate wildly because they’re a fad that aren’t fit for purpose. Without extorting money from the public, the renewables companies go bust. SO given that we are only the foothills of reducing CO2 and all sorts of groups are already suffering (more than the group you came up with), do you accept that the pain will get worse if we are to significantly cut CO2? The UK is already massively in debt. Buying expensive white elephants instead of cheap reliable power stations, is a dangerous policy. How do we hope to support industry with the most expensive energy? Are all those people employed there expendable? Germany protects its industry (contrary to EU rules) which means the public suffer. Is that more acceptable? Do you not accept that a country that makes bad decisions can impoverish itself and its citizens? Make your country’s products too expensive (when quality and demand are factored) and you don’t sell them. Ok, maybe you can just trade with yourself but few countries go that route and those that do stagnate. Value is all about perception. Value = perceived benefit / perceived price. How can it be anything but volatile? Value destruction is as simple as people changing their minds about something. The fancy car I sell you could go from being a valued possession to a shiny lump obstructing the garage just on the basis of people deciding they don’t want their cities and lungs polluted. But I’ve still got your money – no value destruction from my perspective. It would be as silly to claim that nobody will be hurt by emissions reduction as it would be to claim that nobody will gain. You want to claim, with no apparent evidence, that the one overwhelms the other, leaving us “impoverished”. I dare say that goes down well with other alarmist doom-mongers in the “skeptic” tribe, as does your fanciful talk of abandoning every other issue to cut CO2. Prove that cutting CO2 significantly won’t impoverish a large section of society. Prove that current plans even make it possible to significantly reduce CO2. Certain things have always had high value. Energy. Choice. Freedom. Wealth. Space. Comfort. Specific items may fluctuate in popularity but the fundamental wants and needs remain the same. Renewables do not satisfactorily service those key needs (other than for the crooks who sell them). If renewables were all there was, we’d be happy to have them, but until that time they’re just virtue signalling, bought on credit. I was one of the people interviewed.. I might publish the transcript, it would be interesting if all the sceptic voices outed themselves and published the transcript. So from a blanket claim that cutting CO2 will “impoverish ourselves”, you’ve retreated to it impoverishing “a large section of society”. That is progress, I suppose. Now all there remains to argue about is the meaning of “large” and the meaning of “impoverish” in a society with a welfare system. 1% of the UK population would be 600,000 which sounds large, but if the other 99% were better off that would probably be as acceptable as many aspects of economics. Certainly not what doom mongers like you seem to forecast. But one step forward, another step back: you now classify all people selling renewables as crooks. Does that include the man who installs panels on my roof, his co-workers, his secretary, the importers and distributers, their children too perhaps? You have such a low opinions of your fellow citizens (subjects) that I’m surprised you are even bothered if a “large section” of them are now or may become impoverished. Raff you’ve more than made it obvious that you’ve got your snout in the renewables trough. What you’ve not proven is that they’ll cut CO2. Ad-hom is your line, isn’t it Tiny? Everyone providing renewables is a crook and all their customers are troughers. Life is so straightforward to a simple mind. And not defending your position is yours Raff. Sharman & Howarth would be able to understand that the two sides have no point of agreement if they studied you. You don’t deny that renewables aren’t working but you greedily want other people to pay for your subsidy panels. You want non believers to be forced to agree with your religion (following it seems to be optional for all). You don’t care who is hurt by the costs of the plans to cut CO2 or even that CO2 isn’t going to fall in the way was hoped because those plans don’t work. But to be fair, you’re one of the most committed CAGW followers, as you prove by hanging about sceptics all the time. Let’s hope that CO2 isn’t really a problem because with you the cream of the warmist crop, we’d be fu***d.
Hi Barry, I think you may have something interesting to say, but it is a bit like being in a noisy bar here, with Tiny playing around with one of the regular loudmouths. The paper sounds quite interesting, although it seems obvious that some of the climate campaigners with a science bent see themselves somewhat in the role of saviours, and some do so more explicitly as part of their Christianity. From the old-timer himself, John Houghton through Mike Hulme to the more youthful John Cook and Katherine Hayhoe, and the less scientific more emotional Bill McKibben, theirs is a clear mission to save us from ourselves while gaining spiritual brownie points for themselves. Theirs is an admirable religion, and they are no doubt all very sincere. But are they immune to contrary evidence? Are they operating on unshakeable faith? Can they admit no virtue to those of us they may see as being on the dark side, those of us us who regard their views as poorly justified and the actions they seem to wish upon society as regressive, destructive, and especially harmful to the young? Barry Woods, these two researchers seems to be genuine seekers of the truth. I’m glad you engaged. On the face of it, the two sides do have commonalities but on key areas we see things in a totally different way. The warmist side is obsessd with getting everyone to agree that global warming is real. Why? Lots of people say they believe in god but break the basic rules on a fairly regular basis. CAGW, if it exists, doesn’t give you credit for believing in it or for trying but failing. The only thing that counts is how we act. If Sharman & Howarth could work out how to get believers to walk the walk without demanding to be paid for their piety, they’d actually score a great goal for warmism. What differentiates the globe trotting warmist from the simple life person? Why do the carbon rich feel justified in lecturing the world? All the Carbon taxes so far are harder than income tax on the poor. They’re based on a tonne by tonne basis and not on income or overall emissions. Even worse still, if the rich are getting an income from renewables or other AGW schemes, they’re making a profit on the CO2 poor. On paper it sounds great to say ‘we must all reduce our emmissions by 10% (10:10 campaign) but someone on 60 tonnes losing 10% is still emitting 54 tonnes but tough on the poor sod who was only emitting 6 tonnes at the start. Why is that so acceptable to people who largely come from the left? How about a voluntary CO2 tax, where believers can pay for renwables etc? That way we’d be able to measure how much belief translates into action. Methinks the collection plate would be pretty empty. The reasons why warmism is floundering are actually easy to see, just no warmist wants to look. John Shade, I’ve seen enough green shoots of understanding to feed the world but they either wither into nothing or if warmists get too close to seeing our side, they get relabled deniers. Sharman & Howarth, seem decent sorts, so I’d not lumber them with it. Warmists ask the same questions over and over again, in the hope that people will give a different answer. People like Dr Lew try to come up with complicated reasons, when they are in reality very simple. The evidence is not convincing enough for us to write a blank cheque for solutions that don’t work. Until a warmist accepts that, what understanding can there be? Tiny, it is not about me. Our discussion shows that your statement “The only way to reduce CO2 is to abandon everything else as an issue and impoverish ourselves financially, physically and in overall progress” cannot be supported (by you at least). You haven’t even tried to identify the “everything else” and you cannot show large scale impoverishment. That you fall back on personal attacks is no surprise from someone in such a weak position. Perhaps the steel-workers at Port Talbot might have words to say to Raff about steel production has been shifted to China and whether the deliberate rigging of the energy market by the UK Government to make it more expensive has had any impact on their livelihoods? It would strengthen your case and perhaps persuade others if you would explain, briefly if possible, the evidence of causation that supports you firmly held belief. I am a scientist and have read widely on climate research and can find no evidence that humans are responsible for the gradual warming of the climate over the last 250 years. There are models, there is plenty of conjecture and there is some rather shaky evidence of correlation; but none of causation. Can you help. More likely they will want to know why their government chose to obstruct tariffs on Chinese steel. Of course, there is more than one thing making British steel expensive but the same process applies. You can load the costs of things will all sorts of social niceties (like the highest minimum wage and renewables) but then nobody wants to pay for it on the open market. Or you only trade with those who do the same thing, and both sides have to stick to it (which nobody does). Communism sought to enforce it, only it turned out that it killed hard work and innovation. Blair and now Cameron are trying the third way which is pay for the shortfall between socialism and capitalism with borrowed money and we are quietly going broke. Raff doesn’t care about that. Once again, it is not about me. You seem to have trouble with that concept. Osborne and Cameron seem to be playing the economists game of claiming that cheap imports of Chinese steel do more good across the economy than the harm done to local steel producers. The greater good offsets the lesser damage. That is the basic bargain offered by globalization for the last 20 years and the steel closures are just a continuation of the same. Like many a good deception, there is doubtless a degree of truth in that bargain.